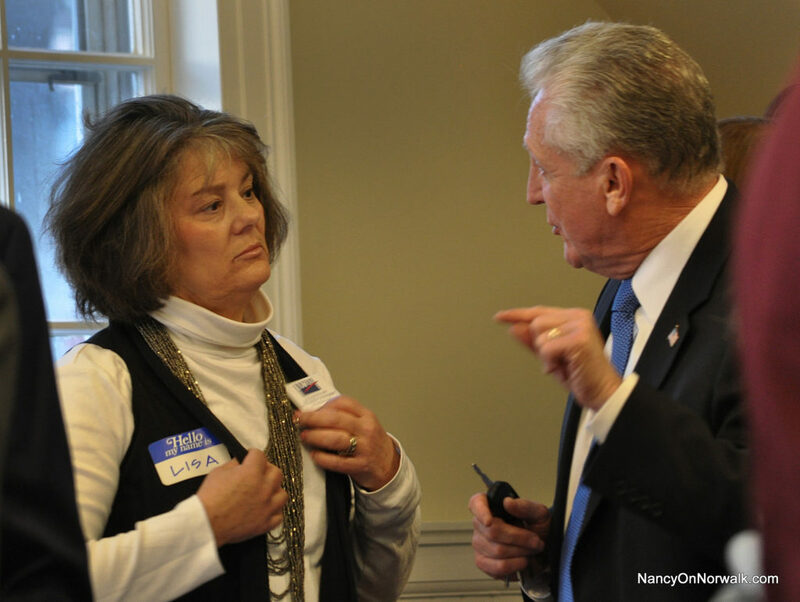 Lisa Brinton Thomson and Mayor Harry Rilling chat in January at a League of Women Voters event in the First Congregational Church on the Green. NORWALK, Conn. – The plot thickens in Norwalk’s 2017 election – Lisa Brinton Thomson is exploring a run for elected office. While the influential and outspoken Rowaytonite declined to say what office she has in mind with her exploratory committee, Republican Town Committee Chairman Andy Conroy said he heard she’s thinking about running for mayor. Conroy himself is a mayoral candidate, as is State Rep. Bruce Morris (D-140). Both are looking to challenge Mayor Harry Rilling for reelection, with Morris preparing a September primary with Rilling and Conroy lined up to get his party’s endorsement next month. There’s also the possibility that former Democratic Town Committee District D Chairman Vinny Mangiacopra, who came in second to Rilling in a 2013 four-way Democratic primary, will announce a run for mayor as an independent. Mangiacopra switched his party affiliation to unaffiliated this Spring, and has not denied rumors that he’s going to run for mayor. Thomson became active in Norwalk politics as an education advocate, cofounding the group Red Apples in 2010. In the last two years, Thomson has switched to criticism of Norwalk’s Zoning regulations, with a Facebook page, “Norwalk Zoning Matters” among her activities. She also attended every meeting of the Charter Revision Commission last year; unsatisfied with the outcome she and fellow activists Deb Goldstein and Diane Cece formed a Political Action Committee, Norwalk First, to oppose two of the four charter revision questions on the ballot. That effort was successful, with the four-year term for mayor and a salary hike for Common Council members going down to defeat. Thomson is a former Board member of Chapman Hyperlocal Media Inc. She described herself in conversations as an unaffiliated voter but spoke as if she were a Republican Party insider. However, she has been registered as a Democrat on and off. Thomson’s legal name is Lisa Brinton. She is commonly called Lisa Thomson. On Tuesday, NancyOnNorwalk asked Thomson if she was running for Common Council. “I filed exploratory papers, but still trying to figure things out and how best I could serve the city. Nothing decided yet,” Thomson replied in an email. NoN reached out to chairman of both of Norwalk’s political parties. “Lisa was invited and did attend an RTC meeting. Afterward ‘we’ discussed a couple of possibilities. Then, after a week or so she declined the possible opportunities we had proposed. NoN reached out to one of Thomson’s Republican supporters, who declined to comment. Rilling declined to comment until he gets more details. “Lisa spent over 25 years working in the U.S., Europe and Asia, giving her a big picture outlook and unique perspective on the future skills American children will need in order to compete in the global economy. After college, she joined AT&T and its spin-off Lucent Technologies, where she directed a variety of initiatives in sales and marketing. In 2002, she became an independent consultant, helping Fortune 500 companies improve employee performance in the areas of communications and organizational behavior. Lisa’s would be a breath of fresh air for Norwalk. She’s results oriented, fiscally conservative, non-political, a hard-worker. She’s a powerhouse. Norwalk First wasn’t formed to oppose two charter questions. It was formed to oppose charter revision activity that did not have the effect of fixing deficiencies in, or improving the function of, our government. As the tagline said, “Do It Right, or Not at All!”. There was simply no case to be made that paying the council more, or giving the Mayor (regardless of who he or she was) would have any impact on the plethora of issues that have been plaguing our neighborhoods, our budget process or the decision-making. The removal of the vestigial offices from the ballot was an efficiency that would save the City money (and labor leading up to, and on Election Day). The gender language change was the only question suggested by the public that the Charter Revision Commission chose to include. On balance, having no negative effect, and being an item that the public considered important, we did not oppose it. Also, I find it a little odd that experienced political people haven’t pointed out to the reporter that an exploratory committee can only exist as long as the candidate is not seeking a specific office. Announcing an office to a reporter is one of the four conditions that triggers the requirement to transition from exploratory to candidate–the public declaration. determine whether he would have a viable candidacy for a specific office. Under Connecticut law, the legitimate activity of an exploratory committee includes the promotion of one’s nomination to the ballot. Once the candidate actually decides to pursue election to a particular office, the underlying purpose of his or her activities is no longer exploration but rather election to office and the candidate must roll into candidate committee. Ms. Goldstein, I can understand you quibbling with me about the formation of Norwalk First but I do not see your point regarding the exploratory committee. The story reports that Republican Town Committee Chairman Andy Conroy has been told by Ms. Thomson’s supporters that she is running for mayor. She has not announced to a reporter that she is running for any particular office. No violation of the law has occurred. No one has ever been accused of breaking the law with thoughts, as far as I know. It is, in my opinion, silly to suggest that someone is not doing something just because they haven’t announced it to a reporter. Not sure if that’s what you’re trying to do, but, again, I don’t see your point. NORWALK, Conn. – With a rallying cry of “Do It Right or Not At All,” three Norwalk women have risen to fight the proposed revisions to the Norwalk charter. I did not hear an objection. In checking again, just now, I found a post from October asking where the second charter revision commission is. One paragraph. I just checked the Norwalk First Facebook page. There are more than 20 posts since November, all of them of a pleasant-general-Norwalk-news variety. None pertain to charter revision. I withdraw my comment about understanding your quibble. I now see it as invalid. I never used the words ongoing OR continuing, with respect to Norwalk First. Among other things, NF members were the only ones who identified the fact that nobody involved with the CRC decision implementation had provided the Town Clerk and/or the Registrars with the statutorily required “explanatory language” for display inside the polling places (and other public places). The efforts of Norwalk First led the Mayor to suggest, very shortly after Election Day, that a new CRC would be convened this term. People were privately invited to join a body to do just that. If NF chose to believe what the mayor was saying, publicly and privately, and stood down from continually tarring him with the referendum loss, that is consistent with efforts for real charter revision. Regarding exploratory. I wasn’t suggesting anyone broke the law. What i was pointing out is how strange it is that experience political folk wouldnt explain that its pointless asking an exploratory candidate what office they are seeking on the record, because the ONLY WAY someone can be in exploratory is if they are not yet pursuing a run for a SPECIFIC office. Its fun to be guessing, but exploratory conversations are just that…exploratory. Just sayin’. Lisa Thomson is a member of the Chapman Hyperlocal Media Inc. (NancyOnNorwalk) Board of directors, in case you didn’t know. Marj, the story specifically mentions that Lisa Thomson is a former Board member of Chapman Hyperlocal Media Inc. If you go to the homepage you’ll see a “Welcome to NancyOnNorwalk” box in the sidebar. In the box you’ll find a link to a list of the Board of Directors. You take a few days to relax, you miss some things. Lisa Thompson – run. The prediction here is – Harry would not agree to a debate.